We are overflowing with zucchini in our garden, and this recipe is a definite keeper for the late summer seasons in the future. You can replace the sausage with lentils for those veggie lovers, creating a versatile delight for anyone’s appetite, or just enjoy as is. Preheat oven to 400° and bring a large pot of water to a boil. Hallow out the zucchini with a knife and ice cream scooper, leaving 1/2 inch of skin for the shell, and coarsely chop the innards. Place zucchini boats in boiling water for 3 minutes, keeping them submerged. Remove and let dry on towel. Brown sausage in skillet on medium-high heat while breaking up into pieces. Add kale, pepper, onions, and garlic until onions are almost caramelized (about 2-3 minutes). Add 1 cup of the innards of zucchini and cook for about 3 more minutes. Add 1 cup tomatoes, salt, and pepper, and cook a few more minutes. Remove from heat, stir in fresh basil and Romano cheese. Pour 1/3 cup tomatoes at the bottom of 9 x 12 baking dish and place zucchini boats on top. Season with salt and pepper and stuff with sausage mixture; evenly distributed between boats. Top with mozzarella cheese, evenly divided onto each. 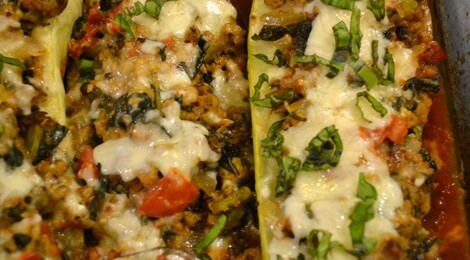 Cover with foil and bake for 30 minutes or until cheese is melted and zucchini is tender.